Let me guess! You are HERE reading this web page because you have figured out that the most important thing that you can ever do when building an online business is to create e-mail lists that bring you buyers, not window surfers! OH! When I first saw these lists online I thought that they were the answer to my prayers. I was so wrong. Paying thousands and only making hundreds is no way to live when it comes to internet marketing, and that resulted in my book. Nobody who visits your site GETS OUT ALIVE until they have given you that email address so you can send them the targeted information that they need so they know to come back and BUY from you again. Why the customer feels committed to you after giving you their email address. How this is an indication that they are willing to spend money on the internet. How you can use their initial purchase to give you an indication of how much money they are willing to spend. How having this kind of list can save hours chasing down new prospects every day. In Chapter 1, I go through the five essential steps for convincing people to sign up and make that commitment to your business. What the several essential resources are that you absolutely need to have in place before you begin your list building efforts. How to create a web page where people can sign up for your list. Just what is a prospecting list? Why you need more than one webpage to collect subscribe information. How to focus the design of your website so it meets your goals when it comes to garnering new list members. How to add content materials that might help convince visitors to visit your site. How to interest visitors who belong to a niche market, such as dog owners. How you can use promotional and advertising materials to appeal to your niche. How to create that mailing list subscription form. How to build a back office system that is set up to deal with a list of subscribers. How to direct your customers right to the page they need to sign up on. Why you should never use a free site building resource. Why it is okay to use free blogs to attract email addresses. Why your site does not have to be that flashy to get visitors. How to register a domain name. How to integrate a Word Press theme into a blog to attract niche customers. How to add content materials to your site. How to determine quality and value material and why that is essential for the well being of your site. What is plagiarism and why you should never copy someone elses work. Why it is best for your articles to be published on as many different pages as possible and not just on one page. How to create squeeze pages for your site. Where to find templates to create squeeze pages. How to write tantalizing short copy for a squeeze page. What kind of numbers you should use to advertise your site and why round even numbers can make you look like you are lying about your promises. Important points about creating bullet pointed lists. Promises that you absolutely must make to your customers regarding privacy, opting out of the list and spamming them. How to test squeeze pages. How to upload squeeze pages onto a blog like Word Press. How to automate as much as your back office as possible. How to use your auto responder to create subscription forms for your site. Why personalizing your emails to your customers is an outdated gimmick. How to come up with a bribe or free gift that you can offer your visitors to encourage them to sign up for you list. How to create perceived value for a free gift so that your visitors will sign up. How to create a free eBook that you can give away in, about two hours. How to construct a phrase that will attract customers to your site. How to get between 400 and 500 traffic exchange members a week using your squeeze page. Does this look like information you can use? Of course none of the above is just adding water and stir, and presto you have big email list. It takes a bit of elbow grease to push prospects to become customers. How exactly to turn them into a customer. How to give them additional information to augment the information that you used to draw them to your website in the first place. How to really target that information so you know that you are answering the questions that they will be surfing for on the internet. How to fulfill all of their needs using information. How to turn a small handful of prospects into many. Why constantly making your product into a new and improved one is a bad idea! How to mine a mile deep and an inch wide by sending out numerous emails about just one product. Why it is a cardinal sin to be boring in your emails. How to build trust and intimacy with your customers so they will buy from you again and again. Are you ready to get creative with your business? They say there is more than one way to skin a cat, and that is certainly true of online marketing. In this book I AM presenting you with a formula. It DOES teach you how to build a content rich site with a list subscription form on every page, how to use squeeze pages and how to give away bribes to encourage sign ups. I also teach you how to build your list using a highly effective autoresponder. Still sometimes you need to deviate from the formula to begin to multiply your profits - to enable your business to grow. Getting creative with your business means using what you have to get further. It is all part of leveraging your business. In order to leverage your business what you really need to do is to leverage off the time and effort of others, if you want to really be able to hit your target. How to think a little more laterally than you have been in order to make better profits. How to delegate tasks and outsource them so you are not overwhelmed. How to turn existing list members into buyers by presenting them with a free gift. How to get your subscribers recruiting new prospects for you. How to get subscriber info from your ClickBank Thank You Page. Using free scripts and programs that produce tell friend forms. How to install development codes for eBooks. How to use joint ventures to expand your list. How to use ClickBank to find new customers. How to orchestrate a joint venture giveaway event! I promise you that I tried to make this book the simplest, clearest yet most definitive and concise contemporary book on putting together an opt-in list that I could. None of this work is difficult, and there is no reason why you cant achieve your 100 list members objective. If you follow the formula for success that was developed by me, you will start earning money very quickly! The system for creating an email list that I have invented is self-sustaining and improves with effort. The more effort you invest and leverage the more you will make! My methods are fool proof. You can build a business empire using them that can viably and realistically ring in thousands of dollars a month using very little startup capital. Yet another quality of my methods is that they are self sufficient. You do not have to monitor and babysit it day and night. It runs itself on autopilot. Its time to get in the know like thousands of other satisfied and successful marketers, and order my eBook! There are no shipping costs as the entire package is an instant download. It is my sincere hope that you get as enthusiastic as I am about showing those self-styled gurus how it is really done. This user friendly manual has proven itself again and again. Its time for you to get in on the action. After you order you will get instant access to my eBook. Its automatic! There is no wait for shipping and you can get the information that you need seconds from now. I invite you to download my eBook right now. If after reading the eBook, you arent able to increase your list sizes dramatically, just ask and Ill be glad to give you a full refund. All purchases may be refunded within 30 days of purchase, meaning that if you think your new eBook isnt as good as I claim, youll get every cent you paid back. If the suggestions put forth in this report doesnt get your list membership up to 1000 members, Ill refund 100% of your purchase price, no questions asked. Why am I taking all the risk on myself? 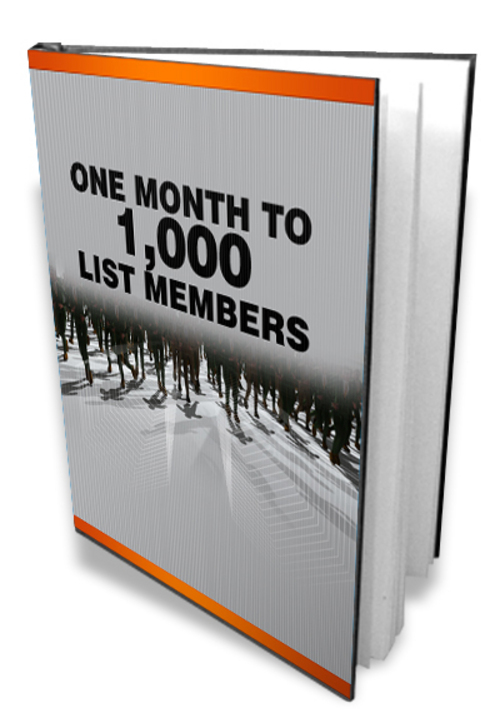 Because I believe in the methods that I have written about in One Month To 1000 List Members. I believe in the results Ive gotten for thousands of new internet marketers, and because of that I believe that this method will work for you. 1000 new subscribers 1000 subscibers -make money online 173676882 41.00 patrick987 Fresh Download Available!